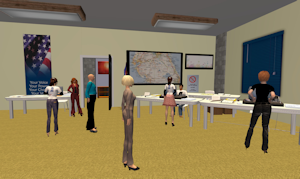 In March 2010, the University of Central Florida conducted poll worker training in the virtual world of Second Life. The school supported the project with funding from the Election Assistance Commission in partnership with the Orange County Florida Supervisor of Elections Office. Students from an undergraduate course at the university were recruited to train as poll workers and work in the upcoming fall election. In order to create a site for training, the school hired a private developer to build a 3D virtual representation of the county’s polling place. Members of the in-world MuniGov group volunteered to serve as voters. This allowed the students an opportunity to interact with a variety of people, many of whom work for local governments. Pre-arranged scripts were used by the volunteers to present several scenarios such as name changes, lost IDs, change in address, and accessibility needs. The training sessions were successful and both volunteers and students enjoyed interacting in the virtual environment. Michelle Gardner (Enelya Pevensey), a PhD student at the university, presided over the training.